Editor's note: From the typewriter to the propelling pencil to our favorite, the world wide web, inventors and innovators from the United Kingdom have brought us brilliant advances that have changed the way we work all around the world. Over the next few weeks, we’ll share a handful of stories from disrupters and trailblazers in the UK who are using Google Apps for Work to enable new, better ways of working in their organisations. Today, we hear from Chris Morton, Co-founder and CEO of Lyst, a platform that aggregates the world's fashion commerce sites in a single place. Six years ago, I shared both a house and a common frustration with two fashion forward women: we loved shopping online, but couldn’t stand how impersonal and time-consuming it was to jump from site to site in search of a new jacket or pair of jeans. I knew there must be a better way for people to find the fashion that fit their personal style without having to explore and buy from dozens of different websites. In 2010, my co-founder and I created Lyst, an online destination that allows shoppers to customize their feed of clothes and accessories and buy from multiple brands and retailers through a single platform. Today, we’re a team of 60 with offices in London and New York, generating hundreds of millions in dollars in sales for the fashion industry. Our unique culture has helped us challenge the way the fashion industry works, not only because we can attract great talent, but because we’ve built an environment that encourages everyone to contribute. 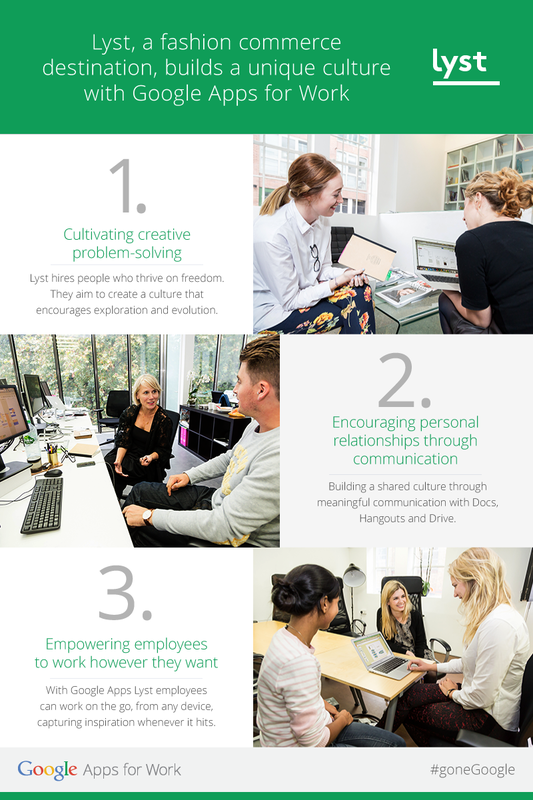 Here are a few ways we’ve built the kind of inclusive, creative culture that define fast-moving startups like Lyst. We hire people who thrive on freedom — they do their best work without someone giving them constant direction. We emphasize this sense of ownership from the moment they join our team: in every employment contract, the responsibilities for the role include “proactively thinking of ways to make Lyst better.” We brainstorm often, both formally and informally, with everyone from founders to new hires, college grads to industry veterans. We evaluate ideas not by who shared them but how much impact they’d have on our business. We work with flexibility, recognising those instances that demand what we call the “screwdriver mode”, which involves tweaking and optimizing fine details. Sometimes we work differently, applying our “sledgehammer mode” when we literally need to break down one element of our business and rebuild it from scratch. As we grow, we need to be intentional about building a shared culture through meaningful communication. Google Docs helps us work more closely together, whether we’re collaborating on a press release or gathering feedback on an investor deck. Because it’s not always practical to fly our New York team to London, our two offices meet via Google Hangouts for bi-monthly all-hands meetings, where we share company news, celebrate sales milestones, and tip our hats to people coming up with great ideas — like a data scientist’s suggestion to use search data to understand buying patterns around bomber jackets versus varsity jackets. We’re considering setting up a permanent Hangout so people can get to know their colleagues from across the pond over a cup of virtual tea. We also track progress in shared Google Sheets, so everyone on the team knows the status of key projects across the team. For instance, our product team use shared Sheets to record development updates on implementing various campaigns and releases. And when it’s time for my 1:1 with our Head of Product, I can follow along with every update by looking at each line item in the Sheet. Building a culture unique to Lyst also means enabling employees to keep up with their colleagues no matter where they are and how they like to work. Google Apps helps us get the information we need at any time and capture inspiration whenever it hits. We often source styles on the go, whether it’s a particular outfit someone sees on the street or trends spotted from the front row at New York Fashion Week. Drive and Gmail apps on mobile let us quickly share the photos we snap and the notes we take with the rest of our team for internal reference and to publish as part of our editorial content. At Lyst, we embrace the fact that everyone is different by creating customized experiences for every shopper. Self-expression transcends fashion, and we want to build our company culture on this same premise. By obsessing over the quality of people we hire, encouraging autonomy and creativity, recognizing excellent work, and giving our team the tools they need to do their best, we’ve created an engaging environment and a unique culture that helps us achieve our goals.